Hi ladies! Tomorrow is my 25th birthday (OMG!) and I want to show you my manicure that I spent most of my night doing instead of doing pre-coursework for my training day on Thursday =p This post will be light on words as I must get to bed! Pinky: I applied 2 coats of OPI What's with the Cattitude? and added icecream nail stickers I got from HK and 1 coat of Essence Glitter topcoat. Ring fingers: I applied 1 coat of NYC Color Snazzle and 2 coats of Milani Jewel FX in Silver. Middle fingers: I applied 2 coats of American Apparel Office (I love this colour! Thanks Alice!) 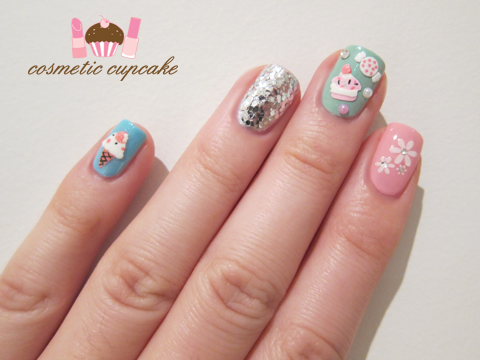 and added cake and candy nail stickers also from HK. I then applied some half pearls and silver rhinestones. The design on my right hand is slightly different. Index fingers: 2 coats of China Glaze Empowerment and floral nail sticker. Thumb: 2 coats of Illamasqua Wink. I then konaded the present design from fauxnad plate b34 using Konad Special polish in white and added a purple clay bow. The design is upside down doh! Eeeeeeek how adorable is it! You should have seen the huge grin on my face when I saw it lol. He always makes such a huge effort to surprise me and he's so thoughtful and creative with his gifts! He definitely puts me to shame when it comes to gift giving xD He takes my blog so seriously and he knows my love of cupcakes haha. The cupcake liner even matched the Tiffany blue! 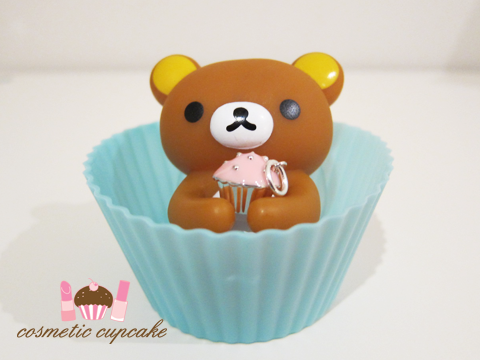 I love charms and I've been lemming this particular cupcake one for aaaaaages but I can never justify the price. Actually I can never justify the price of Tiffany jewellery (especially here in Aus) but anyway it's now mine!! love your nails. so cute! 'chelle, happy happy birthday! Your birthday mani is gorgeous, I love how you made each nail different. 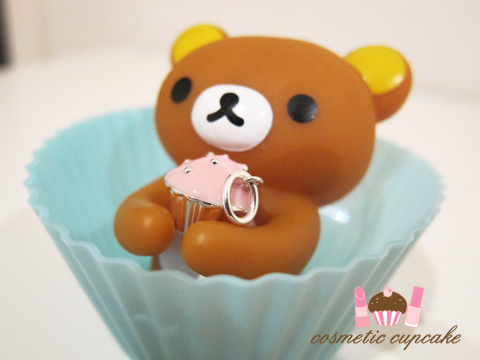 And your bf is so sweet to surprise you like that; Rilakkuma is sooo cute! Both mani and presents are adorable...Have a wonderful B-Day!!! May all your cupcake-related birthday wishes (and others ofcourse)come true!!! HOW CUTE! :) I love your mani too. :D HAPPY BIRTHDAY! Happy Birthday!! :D Have an awesome one! Your mani is beyond adorable, and so is that charm ! Enjoy your day lady ! Happy birthday! I love those nails. Gorgeous! omg chelle, adorable nails. so pretty!! and that is SUPER sweet of your boyfriend! My goodness this post is just so full of adorable haha! Great mani! 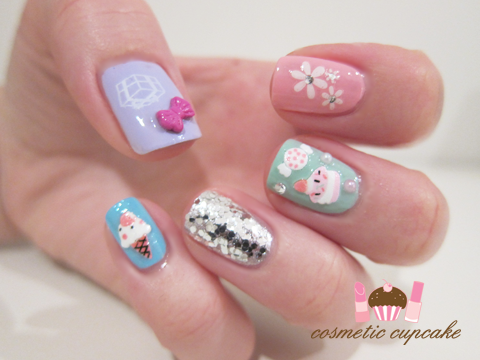 sweet mani! and sweet gift from your BF! that is sooooooo cute! happy early bday! Such a pretty cupcake charm, too! The manicure and charm are ADORABLE! Happy Birthday! happy 25th birthday 'chelle!!!! beautiful manicure!! Happy Birthday! That is the most adorable mani ever! HAPPY BIRTHDAY! That mani is soooo adorable and just seems to fit your personality! Oh my goodness. Your manicure is super adorable! And your bf is extremely thoughtful! That sounds like a perfect gift for someone who loves cupcakes. ZOMG! Dies of teh cute! Happy Birthday. 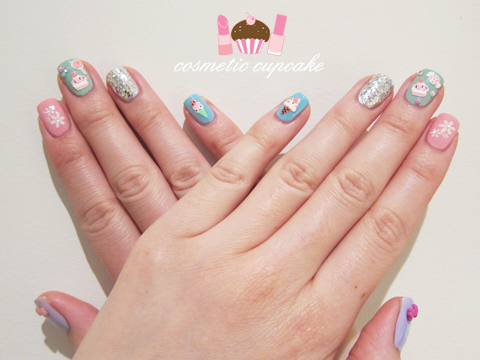 Your nails are so lovely, I adore the pastel colours you used! Sigh, your manis are always so creative and fabulous. Supa jealous! And the bday gift, that it so freakin' cute! Those look great! Happy Birthday! WOW! your nails are sooooooooooooooo cute,great,fabulous and wonderful! Happy birthday! hope you have a fantastic day and get really spoilt! Awww Happy Birthday sweetypie!!!! Mani is absolutely stunning :) Hope you have the most wonderful time! Loooooove the cupcake charm! Well done to your boy :) Mwah! I love the color combination :) Hope you have a Happy Birthday! Happy early birthday doll! 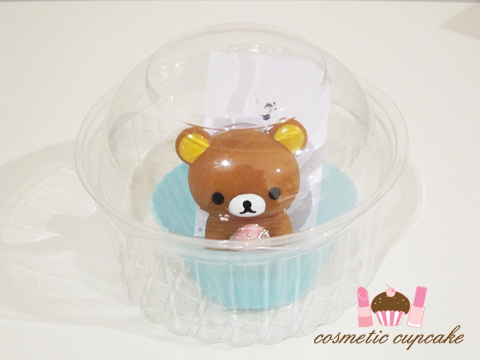 Your Tiffany cupcake is adorable, and the packaging is ever better~ hooray! oh gosh, this is so adorable it took my breath away.. I have the exact same obsession with cupcakes.. and secretly with nail polishes as well.. :D so i totally awww-ed and uhhhh-ed at this post!! omg your nails are AMAZING ! Your nails look adorable and that charm is too cute! I love this! super cute mani. Happy Birthday! The mani is sooo cute! OMG your mani is amazing, so cute (like you hehehe)I love how you combined all the colours and elements! Also you are so lucky to have such a loving bf! The present is amazing!!! And all the packaging he did, just wow!!! your nails are so adorable! and its way cute how sweet your bf is. Your nails are so cute. Aw so sweet. That charm is adorable. I remember seeing it last time I was browsing around. Have a happy birthday. OMG that cupcake is cuuute! Love the nail stickers, so suiting for a birthday! HAPPY BIRTHDAY! This is a gorgeous mani, and very appropriate for the occasion! And what a lucky girl you are! I have been lemming that pendant for aaaages. Happy birthday girl! What a wonderful way to start your birthday with a lovely manicure and awesome present from the boy! I love the cupcake charm! So cute! LOVE this manicure, I'm going to look for that glitter nail polish, I loooooooooove it!!! Happy Birthday Chelle! I hope you had an amazing day, you certainly deserve it. The cupcake charm is adorable and the presentation of it even more so. You've got a winner in that boy! I simply LOVE this mani! I'm not usually one for pastel shades but with all the cute stickers and the silver accent to tie it all together, it works amazingly. Happy early birthday! :) The mani is very pretty but you can never go wrong with pastel colours. And the birthday gift is absolutely sweet and adorable. Aproveito para dizer que sua manicure ficou maravilhosa. Take this opportunity to say that her manicure was wonderful. Hi .... Your nail art is pretty and I love them. May I know where you buy those cute stickers from ???? Happy Birthday! I love the mani it is so cute! The boy sounds like a winner! That gift is adorable. The middle finger is so pretty and I love that entire manicure! These Milanis are going to kill me!I want them so much and they're so pretty! Seeing them in blogger/friends fingers will have to do the job until I get my hands on them. 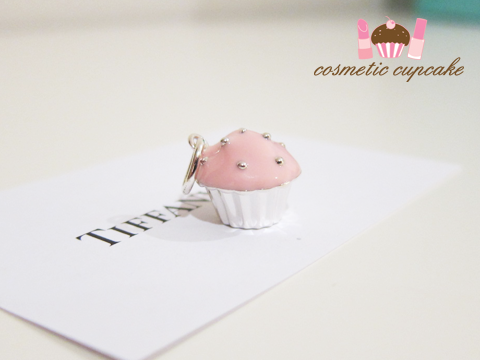 Awwwwwwww, that little Tiffany's cupcake!!! That is the sweetest thing! THANK YOU all so much for the wonderful birthday wishes!!! I am so very touched and you guys all ROCK! I normally reply to each and every comment however I'm so overwhelmed by the number of you that stopped by to wish me a happy birthday that I can't possibly do it lol. Just know that I read every single comment and am so blessed that you guys read my little ramblings and check out my manis. Belated happy birthday! Nice to see you had a great day. Love the nails. And that must indeed be the sweetest way to present a gift ever. This is the cutest manicure I've ever seen! 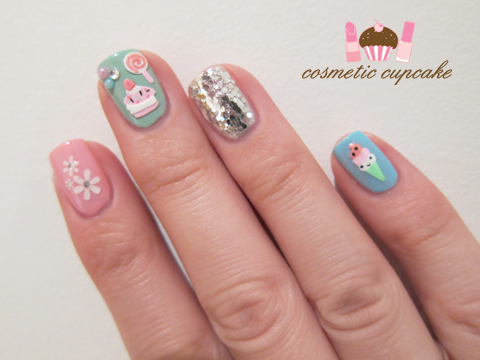 Love the colours and the adorable icecream and cupcake stickers! !